The automotive industry has seen plenty of changes in the last decade with the addition of computerized systems, hybrid powertrains, and energy-saving technology in most vehicles. That means that today’s technician has to be prepared for a technologically advanced environment. “We’re training today’s technicians to industry and manufacturer specifications,” says Beno Rubin, director of the Regional Automotive Center. “If you are willing to do the work, you can be successful,” Rubin says. Revving training into overdrive, courses offered at Tidewater Community College’s Regional Automotive Center provides hands-on learning. The facility features nine classrooms and 15 instructional laboratory bays – including one that will accommodate a tractor-trailer. TCC’s automotive technology program, accredited by the National Automotive Technicians Education Foundation (NATEF), prepares students for entry-level work in the field and provides updated training for those already working. Students learn general automotive repair, servicing, and diagnostics, which include theoretical and practical training in engine overhaul, engine performance, automotive transmissions, power trains, wheel alignment, suspension and brakes, as well as electrical/electronic systems and air conditioning. “What makes this place great is our dedicated, highly qualified faculty. They all love cars, and it shows in their teaching,” Rubin adds. After completing the program, technicians work in dealerships, repair shops, and for various fleets and government agencies. “Most of our students find employment while they are completing the required 567-hour cooperative program,” Rubin says. TCC’s training also prepares students for the National Institute for Automotive Service Excellence (A.S.E) certification tests and the Virginia state inspection exam, as well as the air conditioning refrigerant recovery license exam. TCC’s automotive technology program offers numerous certification and degree programs and career-studies credits that allow employees to remain current. 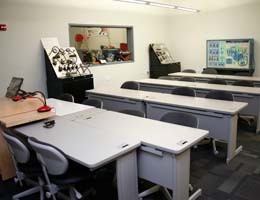 The RAC also features training for diesel and marine applications. The career studies certificates in diesel technology are designed for those interested in entering the workforce as diesel and/or marine diesel technicians. The diesel and industrial machine repair track is focused on diagnosis, repair and maintenance of semi-tractors, as well as construction and agricultural equipment. 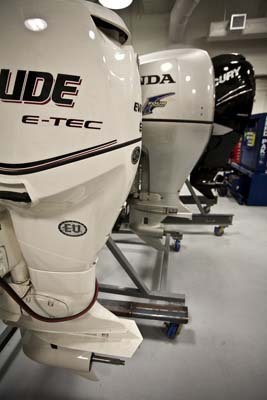 The marine diesel technician program provides students with the background in marine mechanics, construction and function of hulls, drive power principles, propellers and other practical experience in working with maritime equipment. 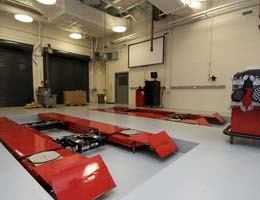 “We strive to be a model training center, and we stay current because of connections with industry,” Rubin says. A well-established model for industry partnerships, TCC’s automotive program boasts an award-winning advisory board comprised of 40 members from all areas of industry, including regional dealerships.